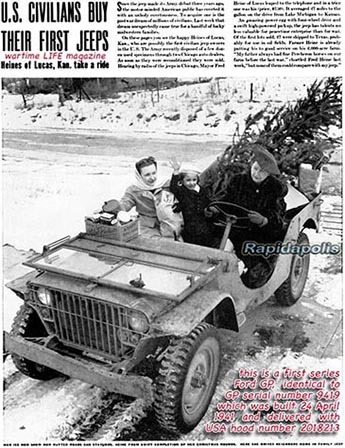 In November 1940, the United States government awarded contracts to three car manufacturers - American Bantam Car Co., Ford Motor Company and Willys-Overland Motors - that authorized each to produce 1500 examples of THEIR PROTOTYPE VERSIONS of a 1/4 ton 4 x 4 truck / reconnaissance car for testing and evaluation. The US government liked aspects of each of the prototype trucks tested but in July 1941 adopted the Willys version as modified with many of the unique features found on the Ford GP versions. 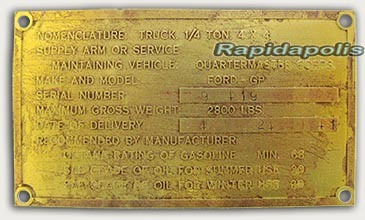 The resulting standardized ¼-ton trucks were the nearly identical Willys MB and Ford GPW of World War II fame, commonly referred to in the field at the time as "jeeps". 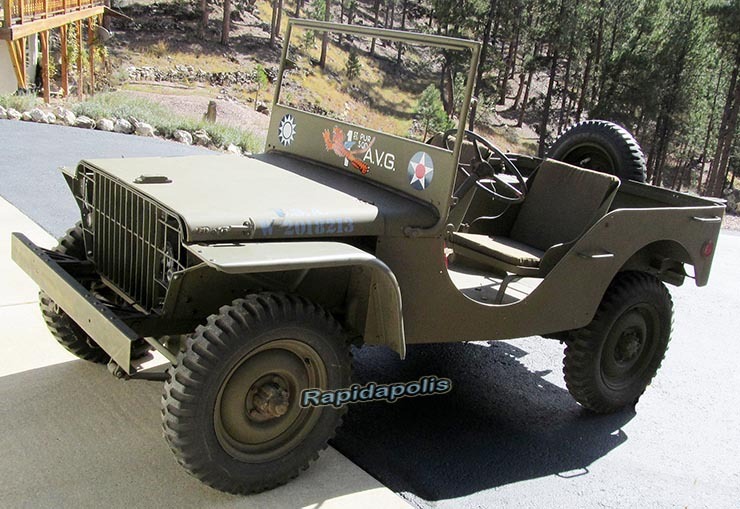 Ford eventually produced about 278,000, and Willys made about 369,000 of the standardized U.S. "jeep" during WW2. Jeep is today a trade name of Fiat Chrysler Automobiles Group. 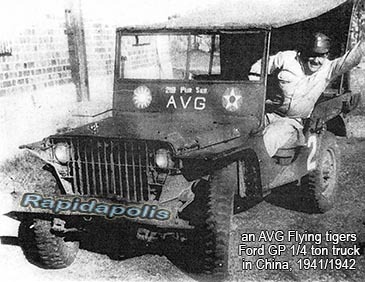 Many of the 1500 Willys-Overland MA, Bantam BRC, and Ford GP prototype 4 x 4 trucks delivered to the US government by their makers were "tested" to destruction, damaged in use, or donated to the governments of places like China (GPs were heavily used there by the American Flying Tigers of the AVG), the Soviet Union, and Britain, leaving the few that remained in the USA to be sold as scrap or war surplus. Of the 1500 first-series Ford GP 4 x 4s made in serial number range 8500 to 9999 in 1941, most experts now seem to agree that there are probably only 50 or so vehicles left in the world. 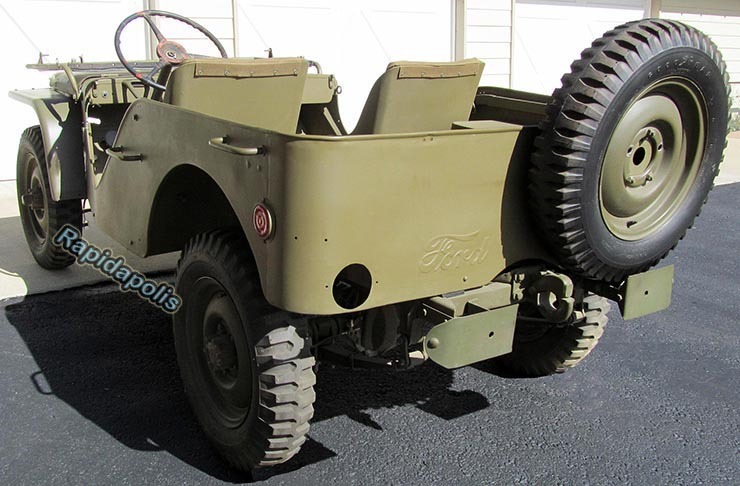 The Ford GP offered for sale here is serial number 9419 and was built 24 April 1941 and assigned the US Army hood number W 2018213 at the factory. Ford GP 9419 was purchased from the family of a hunter at Deer River, Minnesota in 1984 by Willys Mpls. 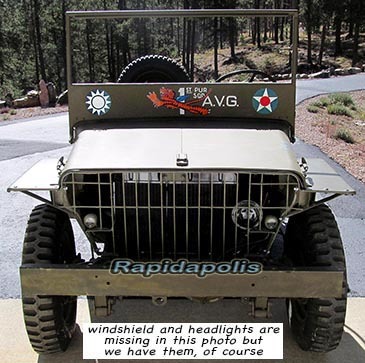 Inc., a company in Lakeville MN that bought, rebuilt, and resold World War II American military jeeps as a business. We can respond to questions regarding this GP 9419, its condition and history only. We can not respond to any questions about unrelated matters. Serious inquiries only: all inquiries should be accompanied by your full name, a complete telephone number, and other pertinent contact information (an e-mail address, the time zone in which you live, and a convenient time and day of the week for you to receive a return call) for example. 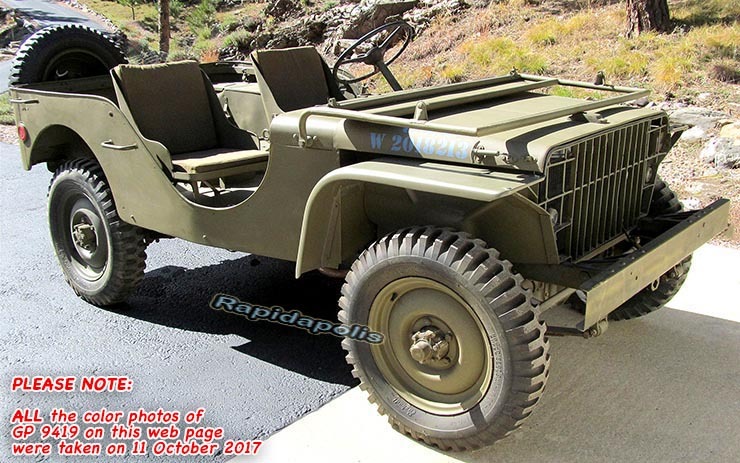 There is a wealth of historical and restoration information on the internet regarding Ford first-series GP 4 x 4 "jeeps." Some of the information is bad, but a great deal of it is very good, reliable information that would make it a relatively easy matter to complete, or carry out the full restoration of the vehicle offered for sale here. 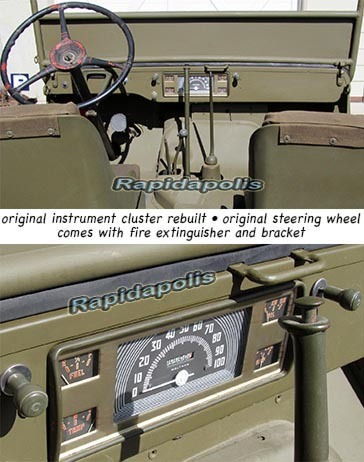 We have basic manuals as well as historical photos of this vehicle and other GPs which we will be glad to include in the sale of this vehicle at no cost to the buyer. The seller of this GP had purchased it as surplus decades earlier, outfitted it with larger 20-inch tires, and used it for hunting each fall on the low, flat, brushy land near his home. 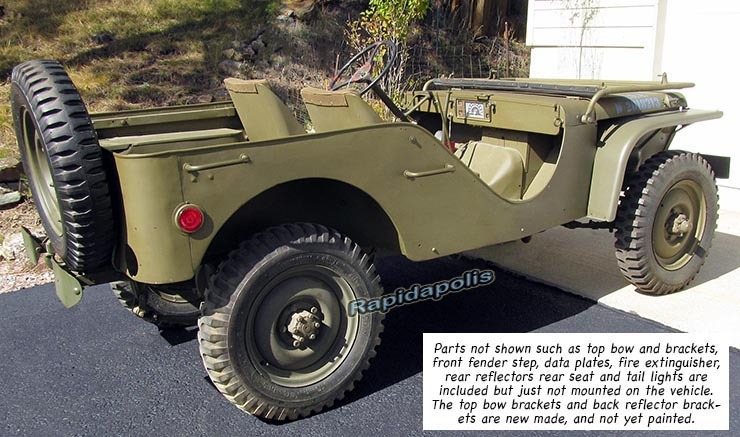 Because of the excellent overall original condition, the low odometer reading, and the round spring eyes of Ford GP 9419, it was sold as received by Willys Mpls. 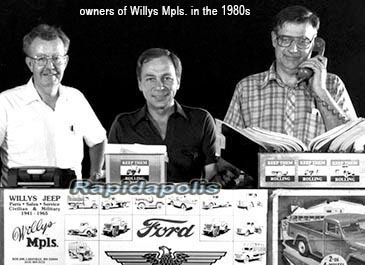 Inc. in 1984 to one of the principles of the company, the man now offering it for sale here. Many ask why Ford called their prototype 4 x 4 a GP. 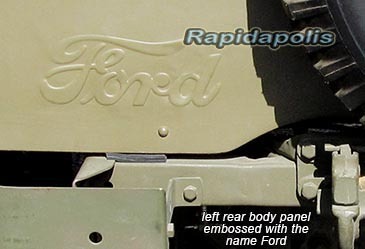 The reason is simple: Ford made many vehicles for the US government and in the parts numbering designation for many of them (GP, GPA, GPW, GTB, etc.) the G stood for "government vehicle," while the P in GP stood for "80 inch wheelbase." 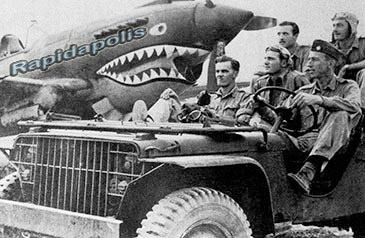 Some observers noted during World War II that if one pronounced the letters GP together, the word sounded like "jeep"! GP 9419 is complete with its original data plates (fairly rare for prototype vehicles) and the data plates match the frame serial number * 9419 * (which is also quite rare for prototype vehicles). As it stands this vehicles weighs a little over 2000 pounds, is about 60 inches wide and 130 inches long. It is 53 inches tall at the top of the steering wheel with the windshield folded down on the hood. It has five non-directional tread 6.00 x 16 tube-type tires with no miles on them mounted on very rare original prototype wheels. complete chassis and body, except for the floor pan (it was rusted through in spots) of the body, including motor, transmission, transfer case, hood, brush guard, lights, windshield, rear seat, and five rare prototype wheels, etc. This GP serial number 9419 as shown in the pictures on this web page, and as described honestly to the best of our ability, is offered for sale at the very reasonable and realistic price of SALE UNDER CONTRACT, as is, where is, with no warranty expressed or implied. This 76+ year old vehicle is 95% complete and almost everything has been restored or rebuilt by experts - the front and rear end, transmission and transfer case, engine, headlights and taillights, gauges, carburetor, etc. The sheet metal is all original except for the floor pan in the body, and there are quite a few rare bolts and nuts and some new-old-stock parts. The few small things that are missing would not be particularly difficult to find. The vehicle has never sat outside since it was purchased in 1984 and has spent the last 20 years in a tight, dry garage at 4500 feet elevation in the high desert climate of the Black Hills in southwestern South Dakota. The GP is located only about 20 miles off the I-90 freeway on a good tar road. 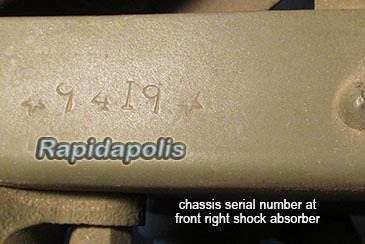 The original 4 cylinder GP motor that came with its GP head in this GP when it was purchased from the original civilian owner in 1984 is block serial number * 9482 *. 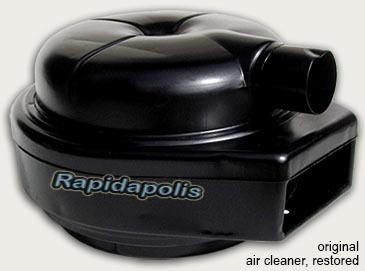 The motor was free so it could be turned easily with a crank. 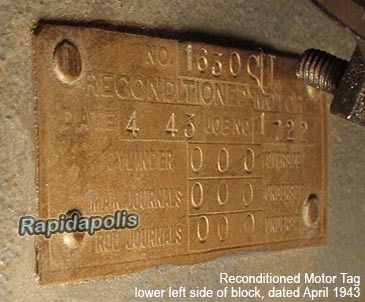 As you can see in one of our pictures, there is a RECONDITIONED MOTOR tag dated 4-43 riveted to the block below the block serial number, and this motor was reconditioned again in 1984. 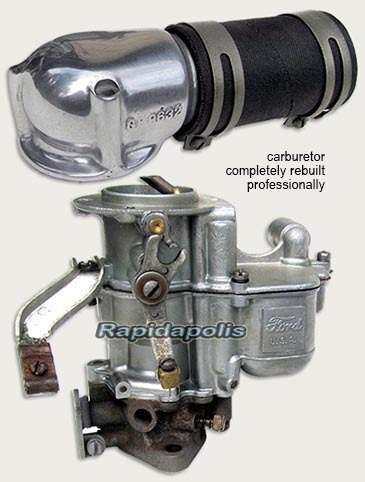 The motor that came in each first series GP was essentially a Ford 9N tractor motor modified by Ford when they made it in 1941 to accommodate a fuel pump, since the tractor used a gravity fuel system (no fuel pump) whereas the GP did use a fuel pump. When this engine was reconditioned in 1984 it was rebuilt using a complete motor kit purchased from Carlson Ford Tractor & Equipment Co. in Rosemount, Minnesota. 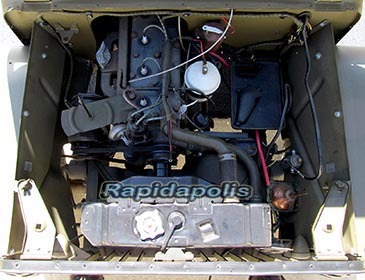 The carburetor and its accelerator pedal-to-carburetor linkage were on this motor when this vehicle was purchase in the Minnesota north-woods in 1984. 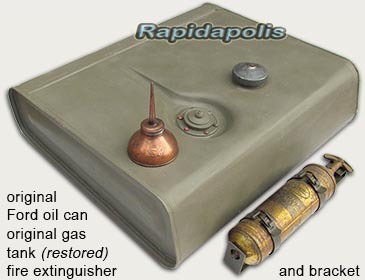 They were presumably assembled on this motor after it was reconditioned in 1943. All photos and text copyright © 2017 by USM Inc.